Last night was beautiful. It began with a walk. I took the dogs out for their usual hike through the wilderness when I realized the silence all around. While the dogs sniffed and dug into a snowbank, I stopped and listened for the slightest sound beyond them. Nothing. Just a clean white crispness to the landscape and a feeling we were completely alone in the world. I began thinking about how this death has affected me. I’ve been feeling vulnerable, depressed, melancholy, and unable to sleep. I keep thinking about those moments before his death and his body disengaged from any soul or life-force similar. I began to feel regret. I began to realize a sadness I had not felt earlier in the week. By the time I got home, I began talking with Erick about what this death means. It means firstly and most obviously the end of someone’s life. Beyond that, it wedges an artificial gap between his own life and the life of his children. It defies explanation and begs the question, “What if.” These are obvious. What wasn’t as obvious was my own disillusionment over our former life together. The feeling I was not at fault for anything that went wrong and suddenly the overwhelming realization I could have ended things better. I could have stayed in touch. I could have cared more and been a bit less selfish. This began a conversation between my husband and I that lasted well into the evening. I sobbed over Bill’s death. Not just because I feel badly about the loss his family is feeling right now, but because I can never make it right with him. And in this thinking, I came to realize it might never have been okay anyway, but what matters now is that I forgive myself for all those things I’ve done in this lifetime far-reaching and having nothing to do with Bill or his death. The word “atonement” popped into my head. I’m not religious, so I don’t think about it in the religious sense of the word, but when I looked up the definition, I found the word broken up into: “At one-ment.” And I realized in another burst of healthy sobs, that I was beginning to find peace in this whole messed up death. I was beginning to feel whole in some way I hadn’t before. It’s strange to say, but when I went to the store last night on my way home, I noticed people differently. I realized how fragile our lives are and how cruel we can be to one another. And I felt love for the people around me knowing they are equally capable of great things and moreover, of love. If I could have changed one thing with Bill, it would have been to remind him how much I still cared even though things didn’t work out for us. I would have reminded him every day of his life, had I thought to do it. And now that lesson is learned. I still keep track of my dreams on another blog. I use the blog as a reference and don’t normally encourage people to read it, but last night I had the strangest dream about being dead. If you’re interested, please visit My Life in Dreams. There was a photographer, H.P. 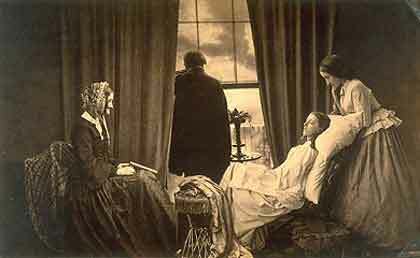 Robinson, who took took a series of shots of a young woman dying and overlaid the negatives to capture those grieving for the girl. He called the image Fading Away. This image is haunting and familiar because in each expression on the face of the grieving relatives is a feeling capable of stretching through time and space to touch us similarly. We grieve along with the girl’s family. And I reached down and hugged my daughter and explained that the children died many, many years ago and they were probably loved very much. “I love them,” she said. “We’ll bring them flowers,” I said. Flowers are like the many cards we’ve received over the last year. Some line my cupboards along with photos of friends. And I’ve noticed how unique and lovely each one is – obviously selected thoughtfully. None of us will escape death phsyically, but we live on in other ways. Four hours later, I learned that a close friend’s mother was killed yesterday morning in a head-on collision. It was a shocking, sickening feeling to register her death. I didn’t know her, but I know her daughter and all who know the family will grieve with them in this time. I hope this brings some sense of comfort – I hope when faced with the unexpected tragedy of death, we might all find comfort in those little things that connect and unite us.